To understand your ancestor it’s important to know what sort of education was available at that time and in that area, if any. We need to find out what schools were available for our ancestors to attend in the area in which they lived. First we need to know something of the educational system in New South Wales. Here is a brief timeline of some milestones in the history of education in New South Wales. 1788 – no provision for education of the children of convicts or soldiers. early 1800s – only schools were private “academies” and “public” schools subsidies or fully-funded by government but run by the Anglican Church. 1801 – Female Orphan School founded to prepare destitute girls for domestic service. 1819 – Male Orphan School founded for destitute boys. 1826-1833 – Clergy and Schools Corporation, run by Anglican Church and funded by grant of one seventh of all land in the Colony. Unpopular with other denominations and private landholders. Repealed in 1833. 1844 – Select Committee found only half of all children going to school. 1848 – Board of National Education introduced government education system. Local communities had to contribute one third of building costs, pay school fees and provide committee to run the school. New National Schools were built mostly in country areas where no schools currently existed provided a minimum of 30 pupils were enrolled, and fees paid. 1866 – Public Schools Act – restrictions on denominational schools, inspection of schools. National Schools became Public Schools, with minimum of 25 pupils. Provisional Schools, where the number was reduced even further, and Half-Time Schools, where a single teacher had to cover two schools, also introduced. The number of schools increased dramatically in the country, where they were most needed. 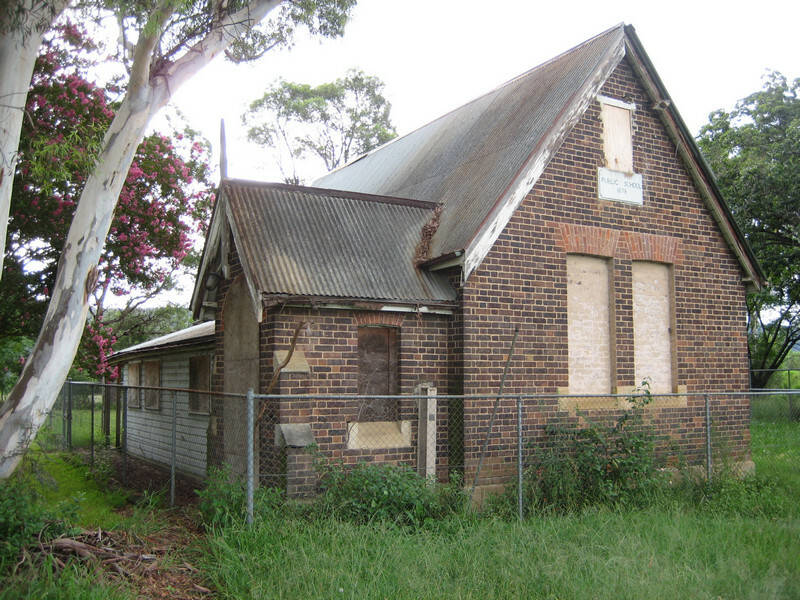 1870s – school available to almost all children but many attended irregularly or for brief periods. Most denominational schools except Catholic had closed or become government schools. 1880 – Public Instruction Act made attendance at school compulsory for 6-14 year olds. Secondary education introduced to prepare for university, with high fees. Funding was withdrawn from denominational schools resulting in the closure or absorption of many of them. New types of schools were introduced. Superior Public Schools combined primary and secondary education. High Schools were purely secondary schools, with high fees and low enrolments, intended to prepare students for university. Evening Public Schools were intended to cater for young people who had missed out on an education before it became compulsory, and ran at night. replaced the Council of Education with the Department of Public Instruction. 1890s – economic depression reduced spending on school buildings and many teachers retrenched, resulting in large class sizes in poor classrooms. 1904 – New Syllabus introduced – learning by doing. 1911 – High School fees abolished. Intermediate Certificate after two years of High School, and Leaving Certificate after a further two years. 1961 – Wyndham Scheme introduced – Four years of High School for School Certificate, further two years for Higher School Certificate. Burnswood, J. and Fletcher, J. Sydney and the Bush, A pictorial history of education in New South Wales. [Sydney]: New South Wales Department of Education, 1980. NSW Department of Education and Training. Government schools of New South Wales from 1848. http://www.governmentschools.det.nsw.edu.au/cli/govt_schools/index.shtm. State Records NSW. State Records Archives Investigator: Activity Detail, School Education http://investigator.records.nsw.gov.au/Entity.aspx?Path=\Activity\25. State Records NSW, Index to Schools and Related Records, 1876-1979. Website at http://www.records.nsw.gov.au/state-archives/indexes-online/indexes-to-education-and-child-welfare-records/index-to-schools-and-related-records. Where did your ancestors go to school? Did they go to school at all? How long did they go to school, and what was being taught at the time? To understand your ancestor it’s important to know what sort of education was available at that time and in that area, if any. We need to find out what schools were available for our ancestors to attend in the area in which they lived. My grandfather grew up near Greghamstown, near Blayney, and I want to know where he might have gone to school. The NSW Department of Education and Training has an online index to Government schools of New South Wales from 1848. A search of the database will give a list of schools containing the search-term, ie a place name, and the type of school, years of operation, alternative names, and the county in which it is situated. We can see that the dates for the different schools in Blayney are consecutive, so they all likely refer to the same school, with name changes reflecting the different stages of the public education system in NSW. Keep in mind how far the children may have had to travel to get to school, and that they may have walked, or rode, many miles to attend school each day, especially in country areas. Clicking on the type of school takes you to the Glossary of Schools. The Glossary of Schools explains the different types of schools, and makes interesting reading in its own right. Once you have found likely schools for the area you can trace their history. If you are lucky there will be a published account of the school, often published to coincide with the centenary or other anniversary of the school’s foundation. State Records New South Wales holds the files that relate to the establishment, maintenance, and staffing of most schools. The files may contain plans of the site and drawings of buildings, so that you can see what the school may have looked like even if it no longer exists. They are available for inspection at the Western Sydney Reading Room at Kingswood. You can see that the files are all administrative files, and that there are none before 1876. To take another example, the school in the photograph is in Greghamstown, near Blayney. The Government Schools of New South Wales from 1848 search shows me that there was a Provisional School from August 1871. It closed in December 1872. A Public School opened in May 1875 and closed in Dec 1947. There are no further entries, accounting for the emptiness of the building in the photo. A search of State Records NSW Schools Index has hit the jackpot! There is usually very little in these files relating to individual pupils, although there may occasionally be lists of parents requesting establishment of a school, or who haven’t paid their fees. For this school, however, there is an admissions register for 1914 to 1926. If your ancestor lived in this area and was of school age within this period you could be lucky! More information about the school records held by State Records NSW can be found here, and about records of pupils here. School has a lasting influence on all of us as we develop into adults and make our way in the world. Discovering the school your ancestors attended and the type of school that it was can tell you a lot about your ancestor. In 1848 a Board of National Education was established by Governor Fitzroy to establish schools based on the Irish system. National Schools were built to provide elementary education for a scattered population not catered for by the four religious denominations already providing education. The schools were called National Schools and in 1867 became Public Schools, when church schools came under the jurisdiction of the new Council of Education. The attendance of 30 children was required for a National School; reduced to 25 for Public Schools in 1867 and 20 children in 1880. Until the 1880s there were no publicly-funded secondary schools, and very few until 1910. Some Public Schools became Superior Public Schools, offering some secondary such as higher mathematics and languages. Existing Public Schools remain today as elementary, or primary, schools. Many country areas did not have enough children to justify the building of a National or Public School and so in 1867 the Provisional School was introduced, requiring a minimum of 15 children. Parents were required to pay for the building and furniture, and the Council of Education (later the Department of Education) provided books and equipment, and paid the teacher. The minimum number of children was reduced to 12 in the 1880s and by 1945 the minimum was 9 children. Even though the Department made provision to supply all or part of the cost of buildings in 1882, most of the cost was still borne by parents into the 20th Century. Teachers had minimal or no training. The remaining Provisional Schools became Public Schools in 1957. Schools with at least 10 children but less than 25 could be visited by itinerant teachers who travelled between a number of schools. These schools, introduced in 1867, were called half-time schools when the number of schools a teacher had to service was reduced to two schools in 1869. The minimum number of 20 children (across the two schools) was reduced to 16 in 1898 and the minimum was removed in 1908. In 1912 the Intermediate High School was developed to cater to children unable to attend the more academically-focused High Schools, and took the children to Intermediate Certificate level. Many were renamed Central Schools in 1944. Many of these schools became Junior High Schools and eventually full-fledged High Schools. From the 1920s the role of high schools became increasingly blurred and all secondary schools were called High Schools, although some may still carry their former names and functions such as Technical High Schools. Domestic Science Schools, I’m happy to report, became Girls High Schools and Junior High Schools. Where a community did not meet even the minimum requirement for any type of government school they could establish a Subsidised School, where the government paid a subsidy for each child and the parents had to provide everything else. For a more complete listing of the types of schools see the Department’s Glossary. New South Wales Department of Education, Sydney and the Bush, A Pictorical History of Education in New South Wales. Published by the New South Wales Department of Education, 1980.